MIAMI (CBSMiami) – A North Miami Beach mother and father have been arrested and charged with child abuse after their severely malnourished child was found naked in the street. Police said the child had jumped from the rear window of his house in the 14-hundred block of NE 152 Street, to escape his abusers on Saturday night. The child, who is nine-years-old, was said to have the body of a much younger child, according to North Miami Beach Police. 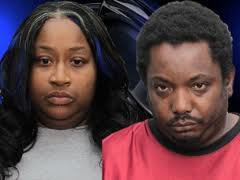 When the child was taken to Jackson Memorial Hospital, it was discovered he only weighed 35 pounds, or roughly the size of a 3 – 5 year old child. Police said the child’s hands and feet were so swollen from lack of food and that the child told hospital staff that he had not eaten in roughly three days. North Miami Beach Police arrested Marsee “Redd” Strong, 34, and charged her with two counts of aggravated abuse and neglect of a child. In addition, Edward Bailey, 39, was arrested for his alleged part in the case and faces two counts of aggravated abuse and child neglect. According to police, Strong admitted to failing to protect her child from others and “not properly supervising him and getting him medical treatment in a timely manner;” but denied physically abusing the kid. She did not dispute that bruising covered most of the child’s body. Bailey also said he noticed the child’s small stature and abuse, but didn’t take him to get medical treatment. After an appearance in bond court, the boy’s mother was held on $65,000 bond. The father was held on $60,000 bond. Neighbors were stunned to hear about the charges. “I was surprised. I was shocked. I didn’t even know what to say when the police were here and the mother was standing on the corner and then I heard the child had jumped out of the window and ran down the street naked,” said Mary Williams. Willie Mitchell said he never saw any problems with his neighbors. Another neighbor said she knew the boy had a severe eating disorder. The victim is one of six children living in the home. The investigation has also revealed that the parents have a history of involvement with the Department of Children and Families. An uncle, Joseph Lee, stepped forward in and asked to care for the boy’s five siblings. But, Judge Lederman said there was gross negligence and appointed a guardian to take care of the children and ordered medical tests for all of the children in the home. Lederman ordered a thorough investigation and expected a full report by the next custody hearing on February 8th. The North Miami Beach Police Department and the DCF continue to investigate the incident and the family.